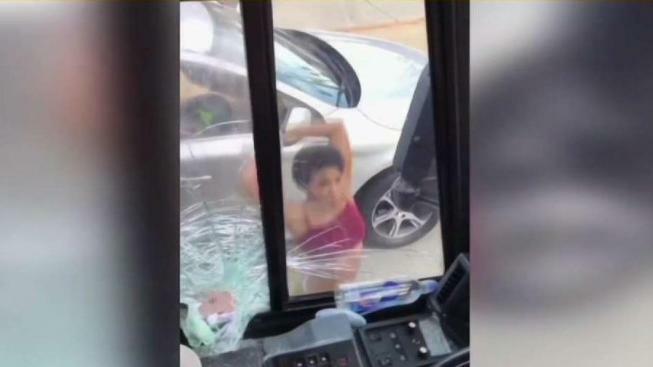 A woman got into a car crash with a Greyhound bus in D.C. Thursday and then flew into rage, smashing the bus's windows with a car jack and hitting the bus driver with her car, police say and an alarming video shows. Cellphone video shows the young woman repeatedly bashing the driver's side window with the jack. Police say she also used a baseball bat to crack the windshield. The video then shows the woman hitting the driver with her car, throwing him onto the hood three times as he apparently tries to stop her from leaving. The suspect, Mariana Silver, 20, of Northeast D.C., was arrested later Friday evening, police said. Silver was charged with assault with a dangerous weapon. D.C. police say it all started when the woman cut off the bus about 6:05 p.m. Thursday in the 1800 block of Bladensburg Road NE, near the U.S. National Arboretum. The bus and her car then sideswiped each other. The bus driver tried to talk with the woman. "You're a crazy driver. You need to get off the road," the driver said, according to a police report. The woman then opened her trunk and pulled out a bat. She started to slam it at the bus, cracking the windshield. Video then shows the woman, wearing a crop top, going back to the trunk of her light-colored Audi with D.C. plates. As cars honk around her, she pulls out a jack and uses it to smash the driver's side window. She puts the jack back into the trunk and gets into the car. A middle-aged man with a cellphone to his ear blocks her path. He's the bus driver, according to the police report. Suddenly, the woman drives toward the bus driver, rolling him onto the hood. People on the bus can be heard shouting. "She's going to f---ing jail!" one woman shouts. A man tries to intervene, telling the woman to leave the bus driver alone. "He f---ed up my whole car," she responds. A young man can be seen trying to soothe the woman. "Calm down, baby girl," he says. But she drives at the bus driver again, rolling him onto the hood as police sirens seem to approach. The young man tries to get the bus driver out of harm's way, but he doesn't budge. "Just move from out the car so you don't get hurt," the man says. The woman then drives at the bus driver a third time, speeding up this time. The force throws him off the hood, just feet from a tire of the moving car. This time, people yell at the man. "Why would you jump in front of the car like that?" a woman screams. "She was gonna get away with it," the driver replies. Multiple people ask him if he's OK.
A man can be heard saying, "I have everything recorded." Then the video cuts out. The woman sped off southbound onto Bladensburg Road. The driver left with pain in his hip and bruises and scratches to his elbow, police said. Silver appeared before a judge Saturday and is being held without bond. She is scheduled to appear in court again Tuesday.